Christmas came early for football fans in Kuwait on Friday night as they were given a treat by legends such as David Beckham, Roberto Carlos and Luis Figo to name a few. The trio made the trip to the Arab country at the official opening of Kuwait’s 60,000-seater Jaber Al-Ahmad International Stadium and as part of the first edition of the global Football Champions Tour. 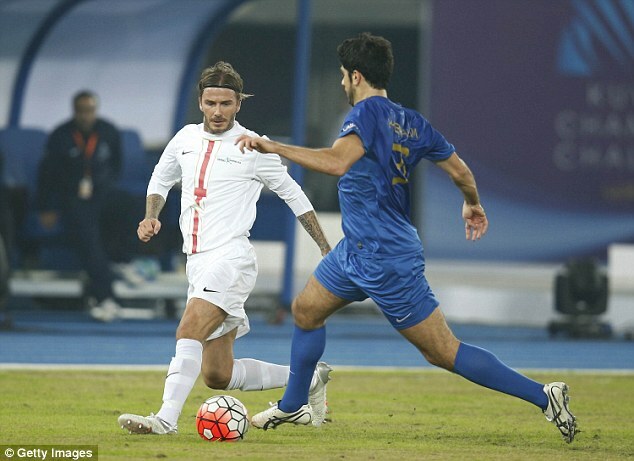 Facing a Kuwaiti All-Star XI, Beckham, Roberto Carlos and Figo were part of an International All-Star XI that also included Dwight Yorke, Alessandro Del Piero and Sportsmail’s Jamie Carragher too. Starting XI (4-4-2): Jens Lehmann; Gianluca Zambrotta, Michel Salgado, Alessandro Nesta, Roberto Carlos; David Beckham, Luis Figo, Robert Pires, Deco; Dwight Yorke; Andriy Shevchenko. 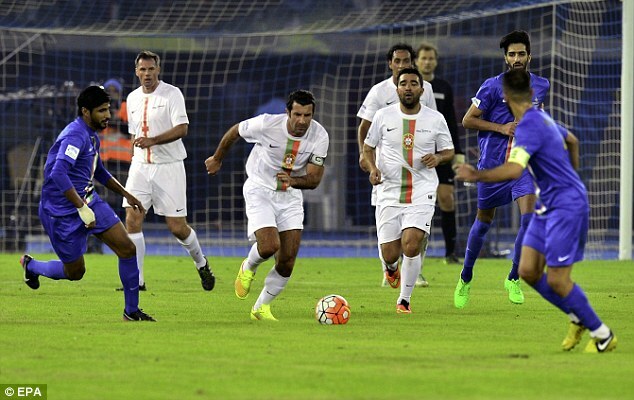 Despite the stunning array of talent within their ranks – the star-studded veterans succumbed to a 4-2 defeat by the Kuwait All-Star XI. Managed by Fabio Capello, the International All-Star XI took the lead in phenomenal fashion thanks to Figo on 15 minutes. The former Real Madrid and Portugal winger timed his run to perfection before volleying first-time past the Kuwait goalkeeper Khaled Al-Rashidi from a Beckham cross. Aziz Mashaan equalised for five minutes later with a near-post finish – beating Carragher to the ball following a cross into the box.